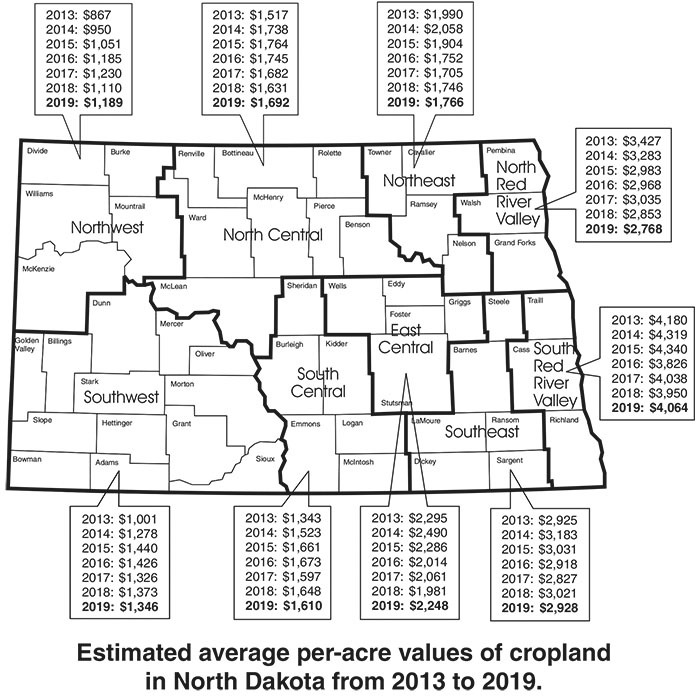 "The January survey reflected the impact of very strong yields and federal aid to producers in the form of market facilitation payments to offset the impact of Chinese tariffs on U.S. farm commodities," explains Andrew Swenson, North Dakota State University Extension farm management specialist. 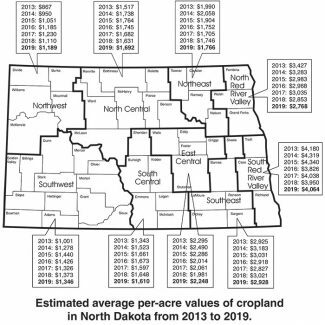 "In 2018, North Dakota had a record spring wheat yield, and the second and third highest corn and soybean yields, respectively, on record," he says. "Market facilitation payments for the 2018 crop should be about $400 million statewide, primarily on soybean production. There would have been downward pressure on land values in the absence of the extraordinary yields and government assistance to stabilize net farm income." 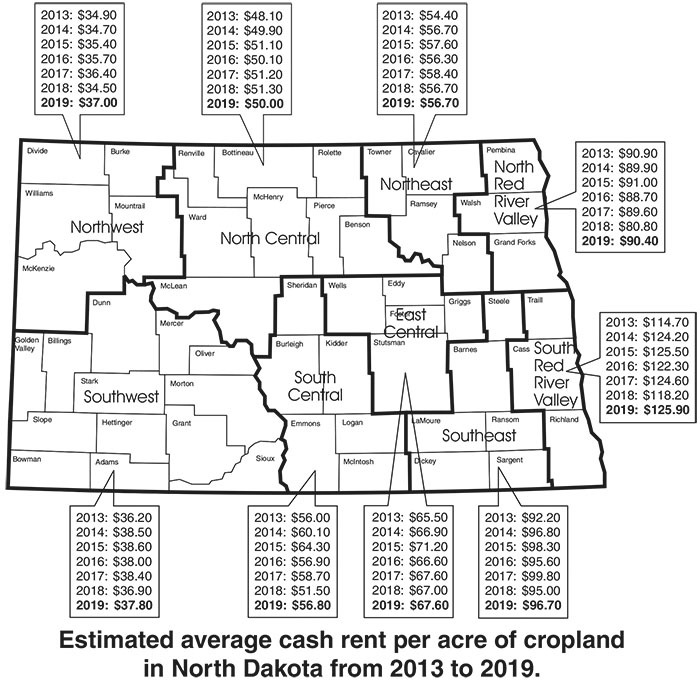 Swenson derived regional and state average cropland values and rents from the published results of the Department of Trust Lands' county-level survey. Swenson believes that the land market has shown resiliency in the aftermath of an 11-year period, from 2003 through 2013, during which cropland values averaged an annual increase of 15 percent. So far, land values have experienced a "soft-landing." The state experienced four years (2014 to 2017) of relatively modest declines in land values, despite much lower crop prices. "Generally strong yields and modestly lower production costs tempered the decline," Swenson says. "There were enough producers and investors who were willing and able to expand their operations and absorb the available land." 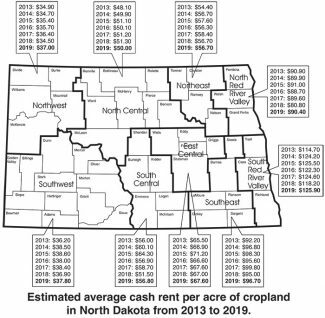 "The 2019 crop year looks to provide a challenge to farm profit and land values," Swenson says. "The low crop price scenario is expected to continue, production costs will be higher, and another infusion of government support is not likely. "One positive is interest rates," he adds. "After increasing in 2018, the current outlook is stable rates for 2019."